The Vietnam War ripped America apart and charted the nation's tumultuous future. In their tens of thousands, young men went off to fight in what was an initially popular war only to face defeat and acrimony as national resolve wavered - and returned home to a nation that reviled them and tried to forget about them. 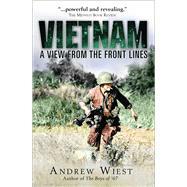 Written by Andrew Wiest, the bestselling author of The Boys of '67: Charlie Company's War in Vietnam this book traces the American experience of Vietnam from the war's popular inception to its morale-crushing and bitter conclusion. Based on rich collection housed at the Center of Military History and at the Vietnam Archive at Texas Tech, Vietnam allows the reader a grunt's-eye view of the conflict - from the steaming rice paddies and swamps of the Mekong Delta, to the triple-canopy rainforest of the Central Highlands, and to the forlorn Marine bases that dotted the DMZ. The stories contained within these pages detail everything from heroism and battle to helicopters hitting the landing zones and death and injury. In their own words, this is a true and grippingly accurate portrait of the American war in Vietnam through the eyes of the men and women who fought in that far away land, and those they left behind.